Comments: Writer/Director Charlie Kaufman is one of the best screenwriters working in Hollywood today, and his previous two films (Eternal Sunshine of the Spotless Mind & Adaptation) are two films that I own and watch on a consistent basis. 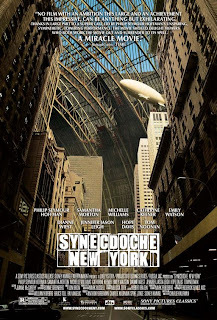 However, the usual depth and wit present in a Kaufman film has worked against me in Synecdoche, because I just don’t understand the film. What makes it the most frustrating and disappointing for me is that I can’t tell if there is a whole world of depth to the film that is beyond me, or if I really do fully get the film, and that’s all there is to it. Comments: Outside of Pixar studios, Dreamworks is the only studio to put out quality animated films on a somewhat consistent basis; but that still didn’t keep me from having low expectations for Kung Fu Panda (in fact I didn’t even plan on seeing it). So it was to my surprise that Kung Fu Panda turned out to be a splendidly fun animated film. 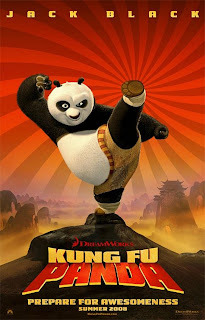 Kung Fu Panda features some lovely animation, a simply told story, and a real passion for the kung fu genre. It has all the lightness and charm of The Emperor’s New Groove combined with the kinetically choreographed action of The Incredibles, a true surprise. Comments: How on earth do I put one of the year’s most critically acclaimed films as overrated? Certainly Wall *E is a decent story as well as a true triumph of art direction and sound design; but as anything deeper than a cute robot love story, I think it ultimately fails (and I realize how much it really is "I", as most of the world disagrees). I felt that while Wall *E’s basic storyline was entertaining, its underlying themes (anti-corporation, anti-consumer, and that humans are inherently lazy) and accusations against human nature not only rang untrue, but miss the truth about humanity all-together. 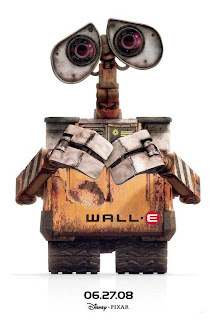 Much like Slumdog Millionaire, I felt Wall *E is a competent and compelling story, just not one to think about too much. 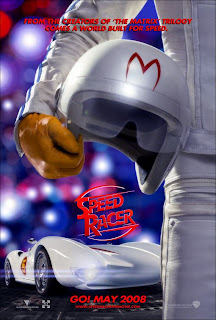 Comments: Lampooned by both the critics and the populace alike, Speed Racer was one of the biggest flops of the year. Several critics called it headache inducing and simply labeled it just another special effects laden film of the OCD age. To say that is to really miss the originality and creativity of the film and the genius that the Wachowski brothers brought to Speed Racer. On display here is a comprehensive new perspective on putting a film together; the writing, the editing, the cinematography, and most of all the direction perfectly cohere to compose a truly unique cinematic film. Aside from the creativity and the uniqueness of the film, it really is an enjoyable movie, with a great message about the importance of family. I hope the world gives this film a second chance, for its one of the standout films of 2008.